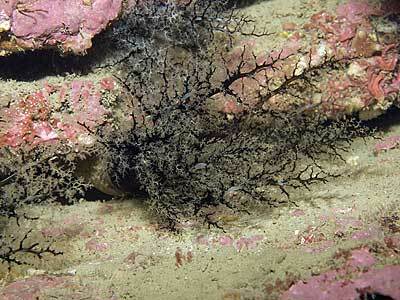 Description: A brown leathery body and dark brown tentacles emerging from a crevice are characteristic of this species. There are five distinct rows of tube-feet and the introvert is dark brown. The main spicules are knobbly with four holes and there is a layer of smaller basket-like spicules just below the surface of the skin. 15cm in length, tentacles 10cm. 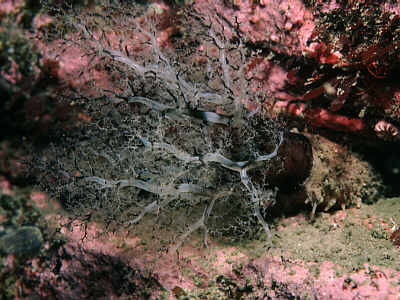 Habitat: Lives in rock crevices in areas of moderate water movement and clean water conditions. Low water-mark to 30m depth. Distribution: Found on all western coasts of the British Isles. Similar Species: Most likely to be confused with Pawsonia saxicola with which it is often found. Brown leathery body, tube-feet in 5 rows. Lives in crevices in rocks. Spicules knobbly with 4 holes. Picton, B.E. & Morrow, C.C. (2016). Aslia lefevrei (Barrois, 1882). [In] Encyclopedia of Marine Life of Britain and Ireland.